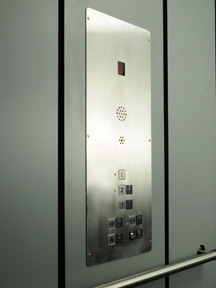 The controls of the Elvoron LULA are the same as would be found on a commercial elevator. Operation is fully automatic. The Elvoron LULA COP features a digital floor indicator, illuminated floor buttons, alarm button, door open and door close buttons and a keyed emergency stop switch. An optional integrated hands-free phone is available. The finish is brushed stainless steel. Mounted in the car doorway, the Car Direction Lantern is an audio and visual signaling device that indicates direction of travel and arrival at the floor. The wall plate is brushed stainless steel. Elvoron hall station buttons illuminate when pushed and whenever the lift is in use. 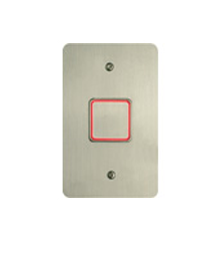 The push buttons and wall plates are made of stainless steel for maximum durability. 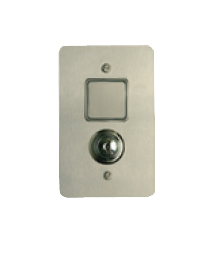 For increased safety and security, an optional key switch allows the entire elevator to be deactivated. Key switches can also be custom designed to deactivate only certain hall stations or to limit access to certain floors.